The 2018 Coca-Cola Thank You Fund has officially launched! The fund offers €100,000 of support for inspirational youth projects. Critically-acclaimed writer and 2018 Thank You Fund ambassador Stefanie Preissner was at the launch, calling on youth-oriented non-profits and community groups to leap into action and get creative with project ideas. 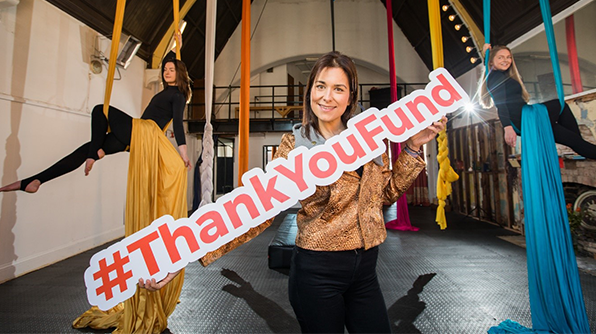 Getting off the ground, an aerial playground, suspended from the high wood-panelled ceiling of a charming Victorian tenement off Dublin’s bustling heart, offered an adventurous setting for the launch of this year’s Coca Cola Thank You Fund. The Aerial Cirque performance studio, on the fringes of the pulsating Temple Bar, teaches young people to quite literally reach for the stars through the mid-air three-dimensional art form. Fitting then that among the colourful silk drapes and steel hoops that enable budding aerialists to express themselves, a fund that helps children and young adults achieve their potential got off the ground for another year. In 2018 Coca-Cola is offering up another €100,000 to support inspirational projects across the island of Ireland that are making a difference in the lives of young people and their communities. Grants of €5,000, €10,000 and €30,000 will be awarded to the winning projects. While most of the applications will be assessed by a panel of expert judges, this year a People’s Choice award has also been introduced, offering the public the chance to vote for their favourite pitch. The Thank You Fund is supported by the Irish Youth Foundation, which helps in the unenviable task of selecting the winning entries. Sabina Cotter from the Irish Youth Foundation, encouraged groups to tell Coca-Cola their stories and apply. “There are a lot of amazing projects across Ireland, both north and south, that are doing really fantastic work with young people,” she said. Apply to the 2018 Thank You Fund.